ITP may be either acute or chronic. The acute form is most common in children between the ages of two and six years; the chronic form is most common in adult females between 20 and 40. Between 10% and 20% of children with ITP have the chronic form. ITP does not appear to be related to race, lifestyle, climate, or environmental factors. ITP is a disorder that affects the overall number of blood platelets rather than their function. The normal platelet level in adults is between 150,000 and 450,000/mm3. Platelet counts below 50,000 mm3 increase the risk of dangerous bleeding from trauma; counts below 20,000/mm3 increase the risk of spontaneous bleeding. In adults, ITP is considered an autoimmune disorder, which means that the body produces antibodies that damage some of its own products—in this case, blood platelets. Some adults with chronic ITP also have other immune system disorders, such as systemic lupus erythematosus (SLE). In children, ITP is usually triggered by a virus infection, most often rubella, chickenpox, measles, cytomegalovirus, or Epstein-Barr virus. It usually begins about two or three weeks after the infection. Acute ITP is characterized by bleeding into the skin or from the nose, mouth, digestive tract, or urinary tract. The onset is usually sudden. Bleeding into the skin takes the form of purpura or petechiae. Purpura is a purplish or reddish-brown rash or discoloration of the skin; petechiae are small round pinpoint hemorrhages. Both are caused by the leakage of blood from tiny capillaries under the skin surface. In addition to purpura and petechiae, the patient may notice that he or she bruises more easily than usual. In extreme cases, patients with ITP may bleed into the lungs, brain, or other vital organs. Chronic ITP has a gradual onset and may have minimal or no external symptoms. The low platelet count may be discovered in the course of a routine blood test. Most patients with chronic ITP, however, will consult their primary care doctor because of the purpuric skin rash, nosebleeds, or bleeding from the digestive or urinary tract. Women sometimes go to their gynecologist for unusually heavy or lengthy menstrual periods. ITP is usually considered a diagnosis of exclusion, which means that the doctor arrives at the diagnosis by a process of ruling out other possible causes. If the patient belongs to one or more of the risk groups for chronic ITP, the doctor may order a blood test for autoantibodies in the blood early in the diagnostic process. If the doctor suspects ITP, he or she will examine the patient's skin for bruises, purpuric areas, or petechiae. If the patient has had nosebleeds or bleeding from the mouth or other parts of the body, the doctor will examine these areas for other possible causes of bleeding. Patients with ITP usually look and feel healthy except for the bleeding. The most important features that the doctor will be looking for during the physical examination are the condition of the patient's spleen and the presence of fever. Patients with ITP do not have fever, whereas patients with lupus and some other types of thrombocytopenia are usually feverish. The doctor will have the patient lie flat on the examining table in order to feel the size of the spleen. If the spleen is noticeably enlarged, ITP is not absolutely ruled out but is a less likely diagnosis. The doctor will order a complete blood count (CBC), a test of clotting time, a bone marrow test, and a test for antiplatelet antibodies if it is available in the hospital laboratory. Patients with ITP usually have platelet counts below 20,000/mm3 and prolonged bleeding time. The size and appearance of the platelets may be abnormal. The red blood cell count (RBC) and white blood cell count (WBC) are usually normal, although about 10% of patients with ITP are also anemic. The blood marrow test yields normal results. Detection of antiplatelet antibodies in the blood is considered to confirm the diagnosis of ITP. There is no specific treatment for ITP. In most cases, the disorder will resolve without medications or surgery within two to six weeks. Nosebleeds can be treated with ice packs when necessary. General care includes explaining ITP to the patient and advising him or her to watch for bruising, petechiae, or other signs of recurrence. Children should be discouraged from rough contact sports or other activities that increase the risk of trauma. Patients are also advised to avoid using aspirin or ibuprofen (Advil, Motrin) as pain relievers because these drugs lengthen the clotting time of blood. Patients with acute ITP who are losing large amounts of blood or bleeding into their central nervous system require emergency treatment. This includes transfusions of platelets, intravenous immunoglobulins, or prednisone. Prednisone is a steroid medication that decreases the effects of antibody on platelets and eventually lowers antibody production. If the patient has a history of ITP that has not responded to prednisone or immunoglobulins, the surgeon may remove the patient's spleen. This operation is called a splenectomy. The reason for removing the spleen when ITP does not respond to other forms of treatment is that the spleen sometimes keeps platelets out of the general blood circulation. Patients with chronic ITP can be treated with prednisone, immune globulin, or large doses of intravenous gamma globulin. Although 90% of patients respond to immunoglobulin treatment, it is very expensive. About 80% of patients respond to prednisone therapy. Platelet transfusions are not recommended for routine treatment of ITP. If the patient's platelet level does not improve within one to four months, or requires high doses of prednisone, the doctor may recommend splenectomy. All medications for ITP are given either orally or intravenously; intramuscular injection is avoided because of the possibility of causing bleeding into the skin. Between 80% and 85% of adults with ITP have a remission of the disorder after the spleen is removed. Splenectomy is usually avoided in children younger than five years because of the increased risk of a severe infection after the operation. In older children, however, splenectomy is recommended if the child has been treated for 12 months without improvement; if the ITP is very severe or the patient is getting worse; if the patient begins to bleed into the head or brain; and if the patient is an adolescent female with extremely heavy periods. The prognosis for recovery from acute ITP is good; 80% of patients recover without special treatment. The prognosis for chronic ITP is also good; most patients experience long-term remissions. In rare instances, however, ITP can cause life-threatening hemorrhage or bleeding into the central nervous system. Linker, Charles A. "Blood." In Current Medical Diagnosis and Treatment, 1998, edited by Stephen McPhee, et al., 37th ed. Stamford: Appleton & Lange, 1997. Autoimmune disorder — A disorder in which the patient's immune system produces antibodies that destroy some of the body's own products. ITP in adults is thought to be an autoimmune disorder. Idiopathic — Of unknown cause. Idiopathic refers to a disease that is not preceded or caused by any known dysfunction or disorder in the body. Petechiae — Small pinpoint hemorrhages in skin or mucous membranes caused by the rupture of capillaries. Platelet — A blood component that helps to prevent blood from leaking from broken blood vessels. ITP is a bleeding disorder caused by an abnormally low level of platelets in the blood. Prednisone — A corticosteroid medication that is used to treat ITP. Prednisone works by decreasing the effects of antibody on blood platelets. Longterm treatment with prednisone is thought to decrease antibody production. Purpura — A skin discoloration of purplish or brownish red spots caused by bleeding from broken capillaries. Splenectomy — Surgical removal of the spleen. 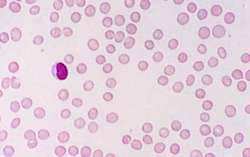 Thrombocytopenia — An abnormal decline in the number of platelets in the blood. a deficiency of platelets that results in bleeding into the skin and other organs. Acute ITP is a disease of children that may follow a viral infection, lasts a few weeks to a few months, and usually has no residual effects. Chronic ITP is more common in adolescents and adults, begins more insidiously, and lasts longer. Antibodies to platelets are found in patients with ITP. The condition may be transmitted to the fetus if the mother is affected. Treatment includes hemophoresis, corticosteroids, therapeutic plasmapheresis, and splenectomy. See also thrombocytopenia, thrombocytopenic purpura. Idiopathic thrombocytopenic purpura (ITP) is an acquired hemorrhagic disorder characterized by an increased destruction of platelets because of antiplatelet antibodies. The antibodies attach to the platelets, reduce their life span, and lead to a platelet count below 100,000/mm3 and occasionally as low as 5,000/mm3. ITP can be divided into two categories: acute and chronic. Acute ITP is generally a self-limiting childhood disorder, whereas chronic ITP predominantly affects adults and is characterized by thrombocytopenia of more than 6 months. The most life-threatening complication of ITP is intracerebral hemorrhage, which is most likely to occur if the platelet count falls below 1,000/mm3. Hemorrhage into the kidneys, abdominal cavity, or retroperitoneal space is also possible. Prognosis for acute ITP is excellent, with nearly 80% of patients recovering without treatment. The mortality rate from hemorrhage is 1% in children and 5% in adults. Older age and a previous history of hemorrhage increase the risk of severe bleeding in adults. Prognosis for chronic ITP is good, with remissions lasting weeks or even years. Acute ITP is thought to be a response to a viral infection. Generally, a viral infection, such as rubella or chickenpox, occurs 2 to 21 days before the onset of the disease. Acute ITP may occur after live vaccine immunizations and is most prevalent during the winter and spring months when the incidence of infection is high. It is also associated with HIV. Chronic ITP generally has no underlying viral association and is often linked to immunological disorders, such as lupus erythematosus, or to drug reactions. While a clear genetic contribution has not been established, ITP has been seen in monozygotic twins, and a predisposition to autoantibody production can run in families. Acute ITP affects children of both sexes and is most common between ages 2 and 4. About half of the children recover in 1 month, and 93% recover completely by 1 year. More than 80% of acute ITP patients recover, regardless of treatment, but 10% to 20% progress to chronic ITP. ITP can also occur during pregnancy, and 5% to 20% of the neonates born to these mothers will have severe thrombocytopenia and are at risk of intracranial hemorrhage during vaginal birth. Chronic ITP occurs mainly between the ages of 20 and 50 years and affects women almost three times as often as men. There are no known racial and ethnic considerations. Global incidence of ITP varies greatly depending on the country and ranges from 10 to 125 cases per 1 million per year in developed regions of the world such as North America, Western Europe, and the Middle East. Few data are available in developing regions. Ask if the patient has recently had rubella or chickenpox or a viral infection with symptoms such as upper respiratory or gastrointestinal (GI). Ask if the patient was recently immunized with a live vaccine. Check for a history of systemic lupus erythematosus; easy bruising; or bleeding from the nose, gums, or GI or urinary tract. Because the symptoms of chronic ITP are usually insidious, patients may not have noticed an increase in symptoms. With a female patient, ask for the date of the last menstrual period, whether recent menses lasted longer and were heavier than usual, or whether she is pregnant. Ask if the patient has had HIV testing. Physical examination of patients with acute ITP reveals diffuse petechiae (red to purple dots on the skin 1 to 3 mm in size) or bruises on the skin and in the oral mucosa. Chronic ITP patients may have no obvious petechiae. Other clinical features of ITP include ecchymoses (areas of purple to purplish-blue fading to green, yellow, and brown with time), which can occur anywhere on the body from even minor trauma. In both types of ITP, the spleen and liver are often slightly palpable with lymph node swelling. Ongoing assessment throughout patient management is essential to evaluate for signs of life-threatening bleeding. Children with acute ITP are usually brought to the pediatrician by highly anxious parents who are concerned with the sudden appearance of easy bruising, petechiae, and occasionally bleeding gums and nosebleeds. Because these symptoms are so commonly associated with leukemia, parents and children need swift diagnosis and reassurance. Pregnant women are concerned about their own health as well as the health of the fetus. Other Tests: Tests include complete blood count and coagulation profiles, blood smear studies, bone marrow aspiration, HIV testing, and computed tomography of the head if intracerebral hemorrhage is suspected. Treatment for ITP is primarily pharmacologic. Because the risk of hemorrhage occurs early in the course of acute ITP, therapy is focused on a rapid, sustained elevation in platelet counts. Children with non-life-threatening bleeding are not generally given transfused platelets because the antiplatelet antibody found in their serum is directed against both autologous and transfused platelets. If the patient fails to respond within 1 to 4 months or needs a high steroid dosage, splenectomy is usually considered. Splenectomy is effective because the spleen is a major site of antibody production and platelet destruction; research suggests that splenectomy is successful 85% of the time. In the face of life-threatening bleeding, such as intracranial or massive GI hemorrhages, a splenectomy is indicated. Other Therapy: Alternative treatments include immunosuppression agents such as cyclophosphamide (Cytoxan) and vincristine sulfate. Plasmapheresis has been attempted with limited success. Many children are managed as outpatients with frequent outpatient visits for therapeutics and platelet counts. If the platelet count is less than 15,000/mm3, the condition may be considered serious enough to warrant hospitalization. Institute safety precautions to prevent injury and the resultant bleeding and to assist with ambulation. Protect areas of hematoma, petechiae, and ecchymoses from further injury. Avoid intramuscular injections, but if they are essential, apply pressure for at least 10 minutes after the intramuscular injection and for 20 minutes after venipuncture. Avoid nasotracheal suctioning, if possible, to prevent bleeding. If a child is being managed as an outpatient, discuss the home environment with the parents or caregivers. Encourage the parents to set up one or two rooms at home (e.g., the child’s bedroom and the family room) as a protected environment. Pad all hard surfaces and corners with pillows and blankets and remove obstructions, furniture, and loose rugs. Teach the patient and significant others about the nature of this disorder and necessary self-assessments and self-care activities. Teach the patient to report any signs of petechiae and ecchymoses formation, bruising, bleeding gums, and other signs of frank bleeding. Encourage the patient to stand unclothed in front of a mirror once a day to check for areas of bruising. Headaches and any change in level of consciousness may indicate cerebral bleeding and need to be reported to the healthcare worker immediately. Teach the signs and symptoms of blood loss, such as pallor or fatigue. Demonstrate correct mouth care for the patient and significant others by using a soft toothbrush to avoid mouth injury. Recommend electric shavers for both men and women. Teach the patient to use care when taking a rectal temperature to prevent rectal perforation. Recommend care when clipping fingernails or toenails. If any bleeding does occur, instruct the patient to apply pressure to the area for up to 15 minutes or to seek help. Teach the patient to avoid aspirin, ibuprofen in any form, and other drugs that impair coagulation, with particular attention to over-the-counter remedies. Provide a private, quiet environment to discuss the patient’s or parents’ concerns. The period of diagnosis is an anxious one, and parents need a great deal of emotional support. If the child is managed at home, parents need an opportunity to express their fears. Bansal, D., Bhamare, T.A., Trehan, A., Ahluwalia, J., Varma, N., & Marwaha, R.K. (2010). Outcome of chronic idiopathic thrombocytopenic purpura in children. Pediatric Blood and Cancer, 54(3), 403–407. Investigators reviewed the outcomes for 270 children diagnosed with ITP over a period of 30 months (range, 6 to 166 months). The median diagnosis age was 6 years (range, 1 to 14 years). In this sample, 37.7% were diagnosed with acute ITP, 49.6% were diagnosed with chronic ITP, and 12.7% were unknown. More than half of the children (50.7%) had persistent thrombocytopenia. Seventy-six percent of the children received some form of pharmacologic therapy, and 18% received a splenectomy. Half of the sample had no response to therapy, and 24.8% experienced complete remission. The remaining children experienced either relapse (10.7%) or partial remission (13.7%). The probability of remission at 5 years was 24% for males and 39.6% for females (p = 0.01). At 10 years, the probability of remission was 34% for males and 50.6% for females (p = 0.01). To prevent bleeding episodes, the patient should avoid both physical activity that may lead to injury and medications that have anticoagulant properties. Instruct the patient or caregiver when to notify the physician and how to monitor for bleeding in the stool, urine, and sputum. Remind the patient or caregiver to notify any medical personnel of bleeding tendencies. If the patient is a school-age child, encourage the parents to notify the school of the diagnosis, treatment, and complications. Explain all discharge medications, including dosage, route, action, adverse effects, and need for routine laboratory monitoring. If the patient is being discharged on a tapering corticosteroid dosage, be sure the patient or caregiver understands the schedule. If the patient had a central line placed for intravenous therapy, be sure the patient or caregiver has been properly trained in care, dressing changes, and sterile techniques. Teach the patient that antacids and oral drugs taken with meals can reduce gastric irritation. Weight gain, anxiety, and mood alterations are frequent side effects of steroid therapy. Parents and families need to be encouraged to lift activity restrictions when the child’s platelet count returns to a safe range. Systemic illness characterized by extensive ecchymoses and hemorrhages from mucous membranes and very low platelet counts; due to platelet destruction by macrophages due to an antiplatelet factor.